Idea of the month (reprise): Make art to support mentoring! Whip out your paintbrushes and prepare to tap into your inner Picasso: From January 10thto January 31st, Grand Area Mentoring will host an online art auction featuring mentor/mentee creative masterpieces. All proceeds will benefit Grand Area Mentoring and help the program provide activity supplies, sports equipment, and match support to you. There is no limit to the imagination, so there will be no limit on the number of pieces of art your mentee may submit. 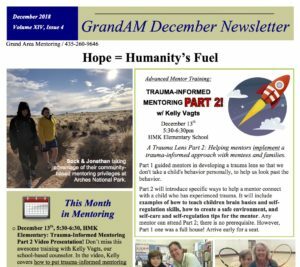 If you would like ideas or prompts for inspiration, or if you have any questions at all, contact Jeff for help: babikj@grandschools.org.Bring your own or use GrandAM’s art supplies. Add creativity and imagination. Make your masterpiece fit into a 16” x 20” frame. Smaller pieces welcome. Deadline: Submit all artwork by December 21st.